Found 17 file extension associations related to FaceFilter and 17 file formats developed specifically for use with FaceFilter. FaceFilter is a versatile photo retouching and beautifying toolkit that allows you to reveal the true beauty of your photos. 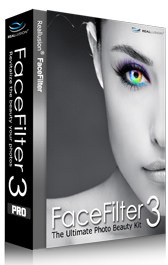 Utilize natural skin smoothing and blemish removal tools along with a comprehensive multi-layer makeup system complete with hundreds of templates for one-click application, not to mention morphing tools and DSLR post-effects. If you need more information please contact the developers of FaceFilter (Reallusion Inc.), or check out their product website.